Union captain Alejandro Bedoya has played 64 times for the United States men’s national soccer team. 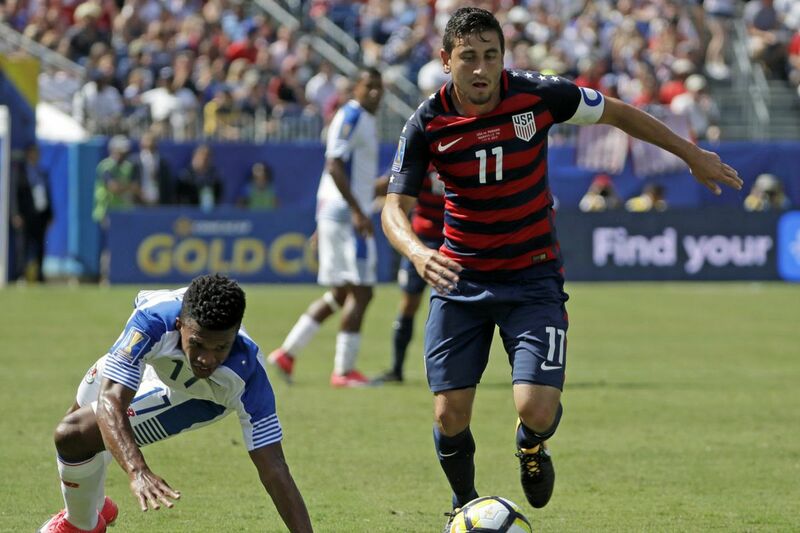 Union captain Alejandro Bedoya and Hershey-born teenage superstar Christian Pulisic are among 26 players on the U.S. men's soccer team's roster for the biggest stretch yet of World Cup qualifying games. The Americans will host Costa Rica at 6:50 p.m. Friday at Red Bull Arena in Harrison, N.J. (ESPN and Univision), then play at always-hostile Honduras on Sept. 5 at 5:30 p.m. (beIN Sports and NBC Universo). Pulisic is playing perhaps the best soccer of his young career for his club team, Borussia Dortmund. The 18-year-old scored in a German SuperCup loss to Bayern Munich on Aug. 5; had a goal and an assist in Dortmund's season-opening 3-0 win at VfL Wolfsburg on Aug. 19; and got five shots in a 2-0 home win Saturday over Hertha Berlin. Bedoya has been unable to keep the Union from another disappointing season, but he has worked hard on the field and in the locker room. His efforts were rewarded Saturday, when he scored a bicycle kick goal in the 2-2 tie with Atlanta United. Now attention turns from the club landscape to the national team. With six games played and four to go in CONCACAF's final round World Cup qualifying, the U.S. sits in third place with six points and a 2-2-2 record. Both losses came at the start of the round last November: a 2-1 home defeat to Mexico and a 4-0 shellacking at Costa Rica. Jurgen Klinsmann was fired soon thereafter, and Bruce Arena was brought back for a third World Cup cycle. The Brooklyn native is undefeated in 14 games since returning to the helm, including a triumph at the CONCACAF Gold Cup earlier this summer. Along the way, the United States beat Costa Rica in the semifinals. Honduras was the opponent in the first World Cup qualifying game of Arena's new tenure. It was a sign of his positive impact that his team roared to a 6-0 win. Since then, the Americans have earned a 1-1 tie at Panama, a 2-0 home win over Trinidad & Tobago, and a dramatic 1-1 tie at arch-rival Mexico. Mexico is currently in first place in the standings with 18 points (4-0-2). Costa Rica is in second place with 11 points (3-1-2). "When I came in, we were behind the eight ball and we didn't have a whole lot of room to experiment, especially in World Cup qualifying," Arena said in remarks distributed by the U.S. Soccer Federation. "Everyone here is experienced inside the group, they know what needs to be done, what's expected of them, our style of play, and how we go about doing things. … To have a group that's together now that has tasted some success in 2017 should allow it to be a smooth transition into this game on Friday." After the September set of games, qualifying will conclude with a two-game swing in October. The U.S. will host Panama on Oct. 6 in Orlando and visit Trinidad & Tobago on Oct 10. The top three teams at the end will earn berths in next year's World Cup in Russia. The fourth-place team — currently Panama (1-1-4, 7 points) — will play a home-and-away playoff against an Asian team, to be determined by a playoff between the third-place finishers in that region's two qualifying groups. Blake to Jamaica: Andre Blake will join Jamaica's national team for a friendly against Canada in Toronto on Sept. 2. It will be Blake's first time playing with the national team since the CONCACAF Gold Cup final, when he suffered a hand injury that forced him to miss four Union games. Players marked with an asterisk are one yellow card away from an automatic one-game suspension for yellow card accumulation. Click here for Costa Rica and Honduras' rosters.